The course starts with an expedition featuring 3 days & 2 nights in mountain huts on both the French & Swiss side of the Mont Blanc Massif before enjoying a less physical and more technical rock day and then a final high altitude day trip to the Italian side of the Range. The Intro+ title refers to this course being run at a guiding ratio of 1:3 instead of our classic Alpine Intro course which is 1:4. This allows for slightly more technical terrain to be undertaken and overall for a better progression for those who have already done a little mountaineering and are looking to build skills and enjoy some more high alpine scrambling terrain. Return across the Trient Glacier and back in to France! 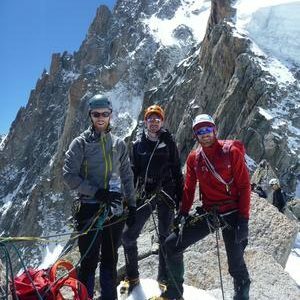 Ascent of Tete Blanche and Petit Fourche. Some enjoyable mixed scrambling on all these peaks. Return to Chamonix via cakes at the Albert Premier Hut on the descent! 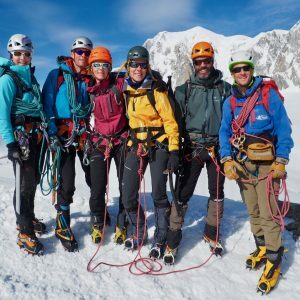 Italy day – Punta Hellbronner glacier journey and scramble eg Aiguilles Marbrees or Aiguilles d’Entreves SW summit. Return to Chamonix mid afternoon on this last day. Thus a superb varied 5 day programme and good value with the 1:3 open course ratio. An action packed week and great opportunity to build skills whilst doing lots of good mountaineering in a team of other like minded guests. 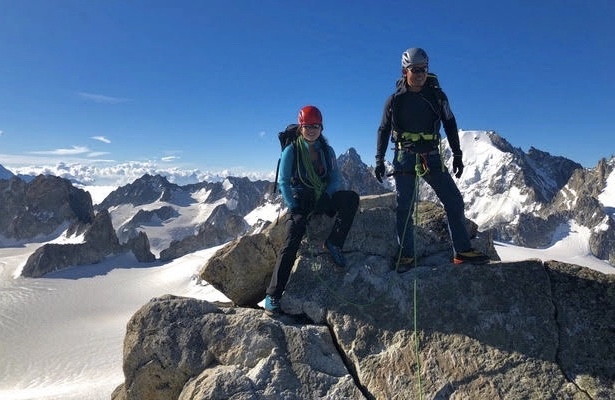 Martha & Vincent start out their 9 day Chamonix Mountaineering programme with a night at the Albert Premier Hut and ascent of the Aiguille du Tour. Whilst it not essential to have any background of rock climbing or winter mountaineering any climbing experience, even at a climbing wall will be useful, as will any general hill walking and scrambling eperience. A good fitness level is required for alpine mountaineering days 6 – 8 hours in duration. 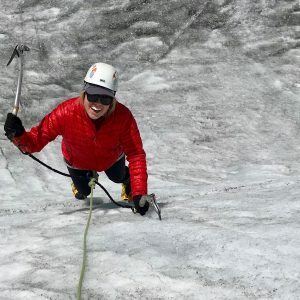 The traverse of the Pigne d’Arolla on the last day is particularly physical and you should be well prepared for around 8 hours on the go at high altitude. This course would also be suitable for climbers with some technical experience who are keen to receive alpine specific training and develop their personal skills with a view to climbing independently after the course.